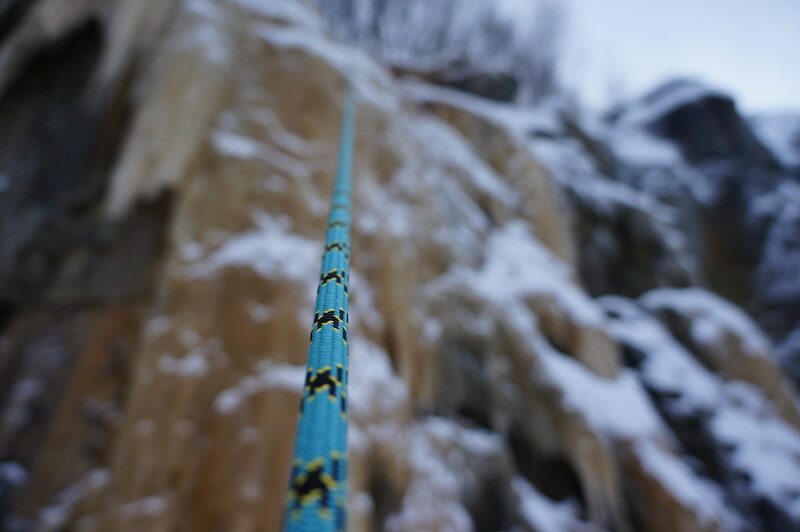 Want to go ice climbing this weekend? I’ve been itching to go ice climbing since winter 2011/ 2012. Last winter things didn’t work out (new born babys tend to demand a lot of attention and wives are less willing to let one go away for long trips) so the plan to go ice climbing was renewed this season. In anticipation of the Abisko Ice Climbing Festival I was hoping to be able to visit a course, but things got in the way. And even as my local climbing club offered a course I was too busy to attend. 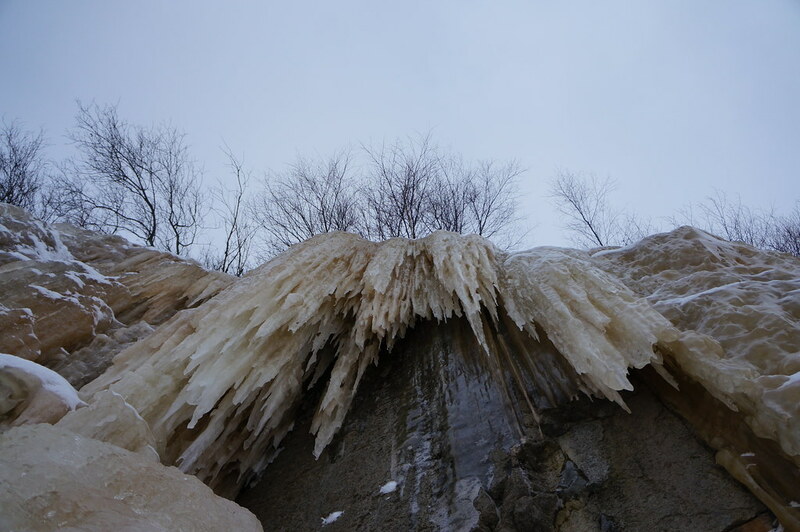 So when Joni, whom I met at the Banff Mountain Film Festival World Tour in Helsinki last autumn, asked if I’d be interested to go to the local quarry for some ice climbing I didn’t need to think long. Saturday evening I was packing gear, adjusting crampons, and packing a lot of food before it was off to bed early. We started early on Sunday, and after we drove to the quarry we walked in the short bit, though the deep, puffy snow made going forward quite a task - skis or snowshoes would have been easier. After checking out the spots we decided on one cliff and geared up. Equipped with ropes we walked to the top of the cliff and set up ropes, here Joni decided for me that we’re now going to rappel straight down - as I haven’t climbed in a bit, I was planning to walk back, but in the end all went well and it was a nice experience to rappel down past icicles. Then it was my turn to make a figure eight knot and start the journey upwards. After a few instructions on ice tool and crampon use I was off. It was fun. It was difficult. It is addicing. The first time going up was the hardest. But with every climb I got better, remembered the ingrained way the body should behave - stay close the the ice, legs straight, heels down, one axe after the other, use the holes from the tools for the crampons. Joni didn’t mind if I needed a break or was hanging like a sack of potatoes in the rope because I forgot to use my legs or blew the crampons out. 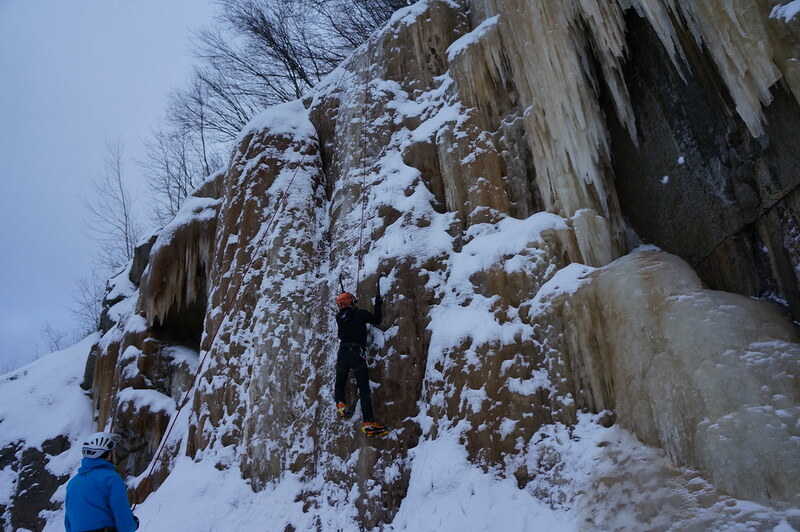 It was a great session, and I learned a little bit about ice climbing. The road ahead will take me to Sweden next week where I should learn a bit more, and if fortune smiles on me, Korouoma in March. Before that hopefully a weekend in Helvetinjärvi, and as often as possible at the local quarry. It is addicing. A big Thank You to Joni for having the patience to teach me ice climbing. I’m looking forward to more adventures together in the future - be they on frozen or liquid water! The ice climbing gear already arrived last December, and I have been playing with it at home, hoping to get to try it outdoors soon. 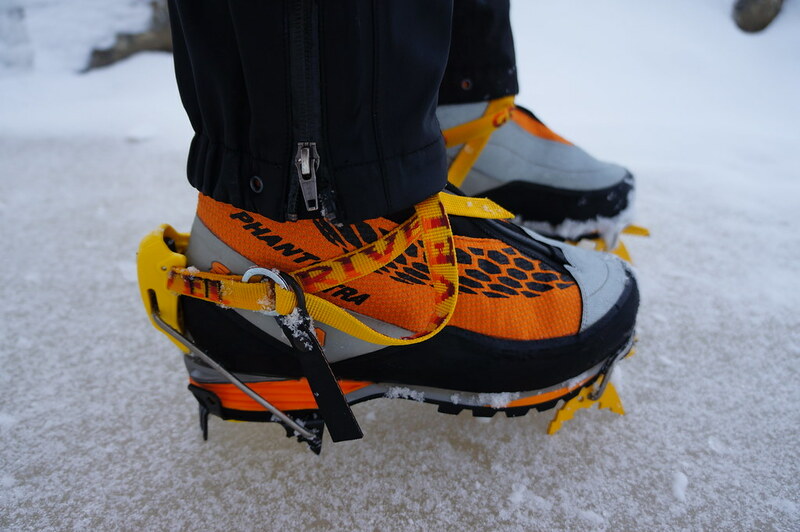 A pair of Grivel G20 crampons, (848 g for the pair or 424 g per crampon), Scarpa Phantom Ultra boots (1845 gram for the pair or 918 g per shoe, Size 42,5) make for a very light ice climbing setup. A pair of Petzl Nomic Ice tools (608 g per tool). Additionally I used my existing climbing gear: A Tendon Master 9,7 mm Single rope, a CAMP Speed Helmet (NEVER climb ice without helmet! ), a Petzl Verso belay device as well as a Mammut Smart belay device and my Arc’teryx R 320 harness. I was wearing POC Iris 3P Googles, the superb Outdoor Research Alibi Pants and the Mammut Felsturm jacket, an Aclima Woolnet baselayer underneath and the gloves of the Rab Modular Mitts; my belay jacket was the Paramo Torres. All gear was carried in a Gregory Alpinisto backpack. The gear performed flawlessly on this outing, some of it has seen plenty of action before, for other it was the first time at the fresh air. I might tell more about it once I get more time on the ice with it under my belt, until then you should do your research at Cold Thistle and Nick’s blog.